The International Association of Eating Disorders Professionals Foundation™ is proud to present its annual body image art competition, an awareness through art campaign, held in conjunction with our Annual Symposium. Imagine Me Beyond What You See was designed to promote a healthy awareness and acceptance of body images. 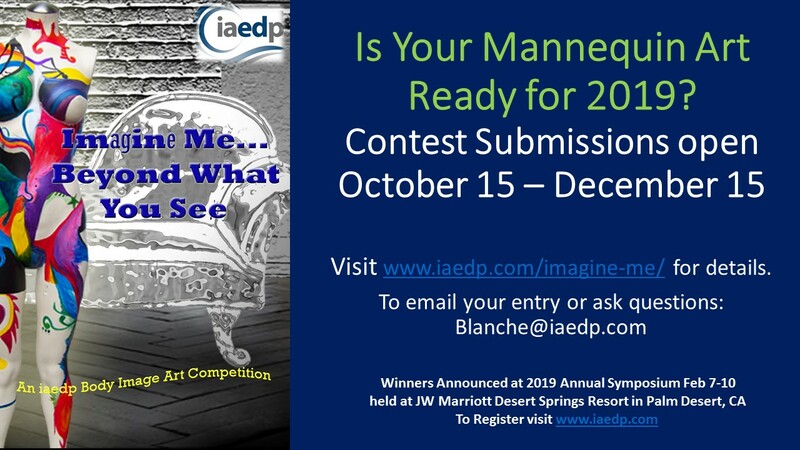 The mannequin art contest is open to everyone; however, iaedp™ is expressly asking treatment centers and private practices with art therapists to work with patients to provide entries. Mannequins may be purchased online. They can be male or female forms and are available in different body shapes and sizes. Some retail stores may donate used mannequins if asked. Mixed media may be used. Entries must include a 300-word description/inspiration of your artwork along with a 2/3 sentence biography of artist/group. Provide a list of the materials you used and submit photos of the artwork in high (300+) resolution jpeg format that shows at least 4 different angles. Entries will be accepted from October 15 through December 15 of every year and will require you to sign an artist release. The First Place Winner along with the Runner Up, Honorable Mention and Professionals Choice are presented during a special Award Ceremony during iaedp™ Annual Symposium. To email entries for questions contact blanche@iaedp.com or 800-800-8126 x 83.